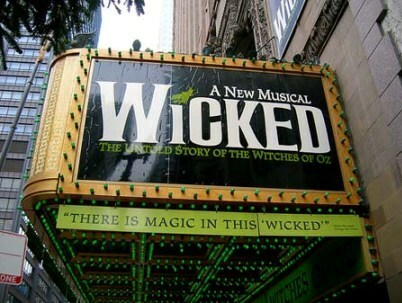 Wicked at Gershwin Theatre has extended its booking through to 24 Mar 2013. The musical opened at the Gershwin Theatre on 30 Oct 2003, following previews from 8 Oct 2003. Long before Dorothy drops in, two girls meet in the land of OZ. One – born with emerald green skin – is smart, fiery and misunderstood. The other is beautiful, ambitious and very popular. How these two grow to become the Wicked Witch of the West and Glinda the Good Witch makes for “the most completely satisfying new musical in a long time”(USA Today) On Broadway and around the world. Wicked tells the story of their remarkable odyssey, how these two unlikely friends grow to become the Wicked Witch of the West and Glinda the Good Witch. Wicked Based on the novel by Gregory Maquire, Wicked has music and lyrics by Stephen Schwartz. Wicked currently features Jackie Burns (Elphaba), Chandra Lee Schwartz (Glinda), Tom McGowan (The Wizard), Kathy Fitzgerald (Madame Morrible), Richard H. Blake (Fiyero), Cristy Cand (Nessarose), Tom Flynn (Doctor Dillamond) and Etai Benshlomo (Boq). A book by Winnie Holzman and is directed by Joe Mantello with choreography by James Lynn Abbott, scene design by Eugene Lee, costumes by Susan Hilferty, lighting by Kenneth Posner and sound by Tony Meola. Buy Wicked New York Tickets Online, Use Code SUMMERFUNTN to Save $10 on Orders of $250 or more! This entry was posted on Saturday, June 2nd, 2012 at 8:48 pm	and is filed under Uncategorized. You can follow any responses to this entry through the RSS 2.0 feed. You can leave a response, or trackback from your own site.